The dark days of November are upon us. Those leaves that remain on the trees become dull and soon join their compatriots to decay on the forest floor. But just look at all the autumn colour strewn on the beach! Light shines through fragments of Bull Kelp, shards of Turkish Towel, and tangles of Succulent Seaweed, detritus tossed onto the sand in casual disarray. Colour and texture galore. On my way to the airport this afternoon to collect Tim, I stopped at Island View Beach for a short walk. The weak sun tried hard to break through the clouds, but the results were patchy, at best. Half a dozen sailboats plied the waters between the beach and James Island. It would have been a good day on the water, with enough of a breeze to catch the sails. The bits of colour remaining stand out against the monochromatic greys and browns of the season. On Saturday morning I ventured out in the drizzle and picked the very last handful of raspberries - just enough for my breakfast. It's been a long season for them. With Tim gone most of the week, I've not cooked very much. As the days went by, I found myself resorting to crackers and cheese with a few raw vegetables. This morning, however, after church, I put a roast into the slow cooker, baked a slender Genoise and topped it with lemon curd and frozen blueberries, and finished cooking a pot of vegetable soup I started last night. We enjoyed a good dinner this evening. Alas, Tim arrived home with a cold and took a nap on the couch this afternoon, and went to bed early. Still, it's lovely to have him home again. Good Morning, Lorrie from cold and rainy Normandy. Sorry to hear that Tim has brought a cold back with him from ,the trip however the wonderful dinner that you prepared last night will soon have him feeling better, I'm sure. The shot of the seaweed and kelp on the beach is an interesting one, what great names they have. Hope the week ahead is kind to you, happy MM. 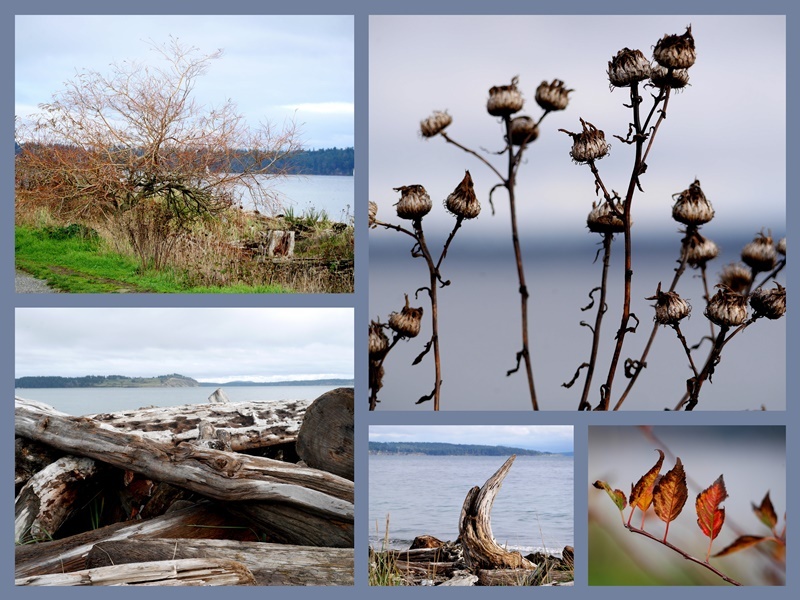 I love this line - "fragments of Bull Kelp, shards of Turkish Towel, and tangles of Succulent Seaweed, detritus tossed onto the sand in casual disarray"
Great photos and mosaics. It is pretty colourless here too - for we got snow! Does it ever snow over there? Wishing you a good week Lorrie! Oh, I'm always so charmed by your so stunning blog posts depicting and portraying your whimsical world, thank you fo sharing all this beauty with us, dearest Lorrie ! Another beautiful post, you certainly have spectacular scenery, whatever the season. Hope Tim is feeling better soon. Isn't it odd that we resort to crackers, salad and cheese when husbands are away! I do exactly the same. Your seaweed photo is just lovely, and makes me want to sew it! Love this time of year as shown in your delightful images and want it to last much longer - I too turn to crackers, chutney, cheese and fruit when alone. I think that there is a danger of eating incorrectly when you are living permanantly by yourself. Lovely photos, as always. The third one (of the James Island?) is interesting. What an intriguing shoreline with some erosional (?) features! Thank you for sharing. Have a happy and healthy week! So much color still to be enjoyed and when it fades even more, you will be reminding us of the textures. Sorry that your husband arrived home not feeling tip-top. Those planes! Those brown crunchy leaves are fine in the woods, but I sure have a lot to move off the yard. :-) Your dessert looks absolutely delicious. Hope hubby feels better after eating all that good food. Stunning colours. Its a crisp clear sunny day here in SW France, but cold, still the colours are fantastic also and the blue skies accentuate the orange leaves. I realize when I visit your blog that I have a limited vocabulary and limited cooking skills but never feel bad about it here. :) Just happy to learn while I visit. Lovely mosaics and fall scenes. Sorry about Tim coming home sick. It must have felt good for him to be in his own space to recover. That dessert looks lovely! Lorrie, I know Tim was happy to be back home, especially with a nice meal waiting. Hope he feels better soon. I love a quiet beach and am so glad you had time to walk (and take pictures) ... am as impressed that you know the names of each part of those colorful tangles as I am with your photo skills. I've tried to take similar pictures with nowhere near that much success. There's always a good chance that at least one of us will have a cold whenever we arrive after a flight... any tiny germ you harbor when you get on the plane seems to multiply in the air. I hope Tim feels better very soon; that meal should help! Beautiful colors, in bright array or subdued. I'm always glad to cook again when my husband returns from traveling, though occasionally I cook, especially trying something new or that he's not crazy about. Your description of the beach floor sounds like a line from a book or a poem. And my goodness is it beautiful. I noticed today that the Tamarack here, which was such a fiery orange last week, has turned a dull rust colour already. How lucky Tim was to come home to such a verity of yumminess! You did make good use of those few remaining lemons Sorry to hear he is under the weather. Your cake is making me hungry. YUM! Sorry to hear your husband's cold, wishing that he'll get better soon. Beautiful colours - the seaweed is fascinating. Yummy cake....and you still have some raspberries! Cold, drizzle, rain but still beautiful pictures and colors. Lucky you still have raspberries! Sorry about your hubby having a cold. And I love having cheese and crackers and raw veggies for dinner. But when My Shug is home, which is almost always, it's more meat and potatoes! Hope the sun shines this week for you! I love the beach photo with its rich colours and the mosaic of the water and bluff. It's not fun being alone all week but when they are home for the weekends we eat well again. lol I hope Tim is feeling better. Your photos are gorgeous. I really love the textures on the sand. And that Genoise looks delicious. Have a good week and I hope Tim recovers quickly from his cold. That beach photo is gorgeous. I’d love to have a scarf like that, a big, warm one to sling over my shoulders on cold evenings. Beautiful pictures and a lovely little tale about a solitary lady enjoying the thought of husband returning to the cosy fireside. I hope he managed to enjoy your delectable food in spite of his cold. Okay, the lemon curd is making my mouth water! The photos are beautiful despite the gray skies. I love the ocean because it always reminds me how small I am in relation to God's creation. Late visiting for last week's MM, as it was a hectic week. I'll admit our election also made me sad. Everyone has such strong opinions about it, and I am sad at the division aftermath. But I have to say your photos cheered me up--I love the views from the Pacific NW! Your lemon curd looked delicious. I hope Tim is feeling much better!